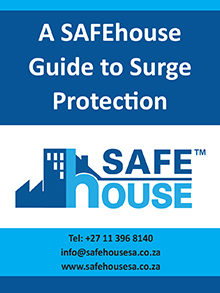 The SAFEhouse Association has published a number of user-friendly guides to provide technical overviews, regulatory information and buying guidelines for the South African electrical industry. Pierre Nothard, chairman of the SAFEhouse Association, says the prevalence of sub-standard electrical products in South Africa is partly due to misinformation and a lack of information. In an effort to address these issues, the SAFEhouse Guides, which have been authored by industry specialists, provide information that is relevant, concise, and that promotes compliance and electrical safety. This guide to Type III surge protection for SANS 164 products provides information on surges, transients and impulses and what causes them and is illustrated with simple drawings. The applicable standards for surge protected products are listed along with details of the required markings that should be shown on surge protected products. This illustrated guide also explains why a thermal disconnector is crucial and what users should look out for to ensure compliance. Click on the cover to download this guide.